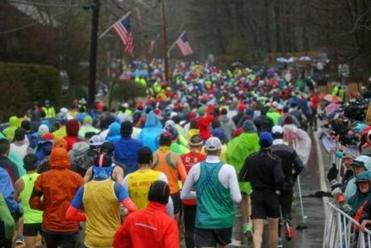 Shalane Flanagan took a surprising detour during the 122nd running of the Boston Marathon Monday. The move was unusual for an elite runner, but iconic marathoner Katherine Switzer said on the WBZ broadcast Flanagan should be able to make up for the time lost because of the slower pace of Monday’s race. Perhaps what was more surprising, however, was fellow American Desiree Linden’s decision to wait for Flanagan to catch up — a move that demonstrated unity and respect. The pair were chatting throughout the early miles of the course, but Linden pulled ahead later in the course and went on to win. The 2018 race meant a chance to join a global running community that persevered through insufferable conditions. Flanagan said her pit stop was just a matter of nature calling. “The pace was slow, and I was just being a lady,” she said. 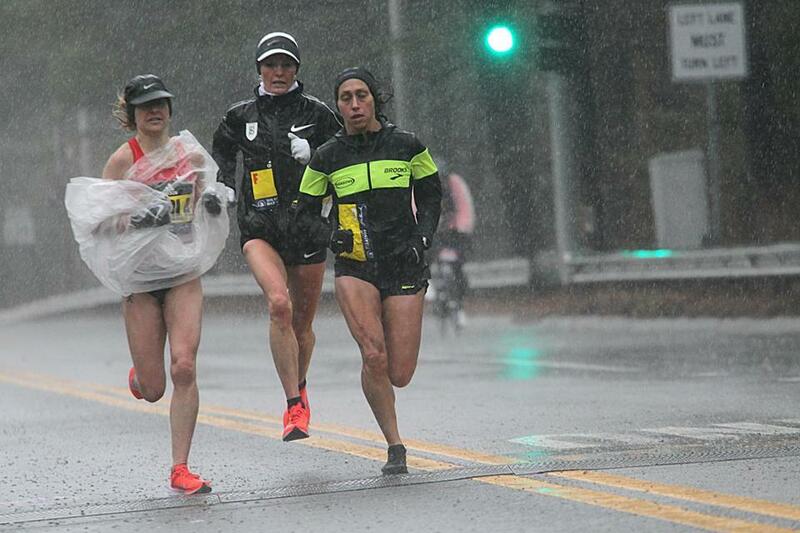 The elite women runners, including Shalane Flanagan (center) and winner Desiree Linden (right), made their way through a downpour in Wellesley. Flanagan acknowledged Linden’s gesture was uncommon. “The only other person I know who would do that is my teammate, Amy [Cragg]. So it’s very uncommon,” Flanagan said. Flanagan wasn’t worried about losing too much time. Steve Hanson, Linden’s coach, said Linden’s decision to wait was partly out of respect, partly strategic. “I think that she has a great deal of respect for Shalane, and I think that Shalane having won New York, there was somebody that would work with her in the late stages if it came down to them two,” Hanson said. “I think that more than anything that she didn’t want Shalane to be out the back door yet. She wanted her to be there. She wasn’t ready to go to the front yet, and didn’t want to go to the front. She wanted to know that if she went to the front, there was going to be someone there every step of the way from then on out, because the headwind was too brutal. Linden said in a postrace television interview that she waited for Flanagan to catch up because she thought she might fall behind the leaders of the race anyway, and could possibly drop out of the race. The delay cost her approximately 10 to 15 seconds. She won by more than four minutes.